Western Chipseal and Paving is a family owned and operated business. 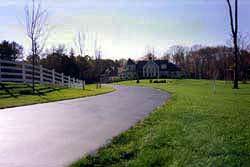 We have the experience and the equipment to handle chip seal (tar & chip) paving, repair, resurfacing and much more. We are the Paving Professionals. We ensure a high-level of work and professionalism from the beginning to the end of all of our projects. We inform our customers of how their job will be completed step-by-step and leave them instructions onhow to maintain their new asphalt. Our staff consists of highly trained and experienced personnel who are ready to assist you in achieving your goals for your paving or construction project. At Western Chipseal and Paving Quality, Service and Performance are always first and foremost. Our Good Reputation – Earned! We believe in being honest with our employees, suppliers and customers alike and this has enabled us to gain an outstanding reputation within the industry. Through the use of qualified personal, and continued commitment to good quality we have become one of the most well-known paving companies in Colorado . We stand by our work. Over 90% of our business is referral due to our high quality of workmanship. We offer a one-year guarantee as we know a satisfied customer becomes an excellent reference. Free estimates are always available – call Now!